WildZests: Chased by a Tusker! 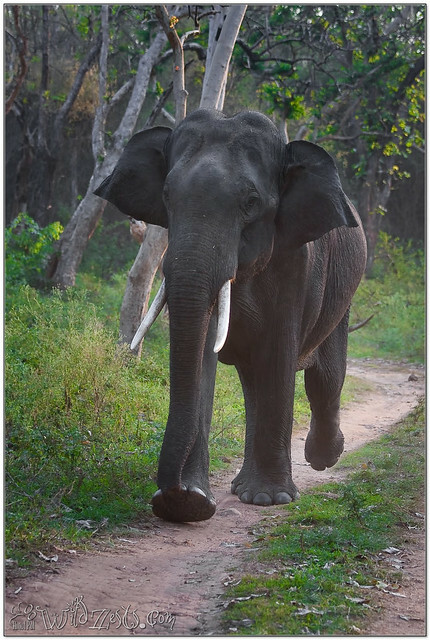 2010 was a year when we had elephants charging at us almost every time we were inside the Bandipur jungle. This was one of those times when we had this tusker not liking our company and trying to drive us away. We've had misses and near misses that year, Gozu got a scare of her life when we were almost stuck in the middle of a herd with a huge female elephant chasing us from behind. These gentle giants have their own mood swings and while sometimes they'll allow you to close in to the herd while they're happily grazing, at other times they'll just want you to leave immediately. Most common charging incidents happen when there's a baby around or there is a lone male elephant, the latter being the more dangerous encounter to have. Whatever be the situation, its always a treat to watch them around. Sometimes you can actually notice their emotional patterns which are seemingly like ours!